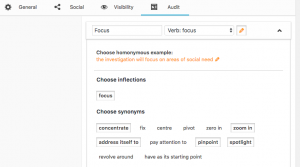 By making use of the Focus extension of The SEO Framework plugin it was an easy job to find meaningful synonyms for each individual keyword. First, enter the keyword in the Audit tab and, when available, different lexical forms for the keyword will be shown. For the keyword “Focus” there were two: verb or noun. Next, choose the most applicable lexical form and you’ll get some relevant homonymous example sentences. Take the example sentence that closely describes your subject, and, when available, different inflections and synonyms will be presented. Then, simply click on the ones you’d like to use. It took me more or less 20 minutes to find the inflections and synonyms for the keywords for the first part of the article. Enough inspiration to start writing, don’t you think?